Golfers at two different courses on Kiawah Island, South Carolina received some surprise company Monday during their midday rounds. At both The River Course and Osprey Point, which are separated by four miles, golfers were just minding their own business when they were confronted by humongous alligators. Via ABC News, this video comes from Osprey Point. Watch how the gator just casually strolls by. According to ABC, the golfers at The River Course did not immediately notice the company. At first, the men did not notice as the alligator approached them, said photographer Carrie Moores, marketing and communications specialist for the Barrier Island Free Medical Clinic. Once Moores alerted them to the gator’s presence, “they hopped in their carts to zoom off,” she told ABC News. A spokesperson for The River Course told ABC that alligators routinely walk onto the course before returning to the pond. That presumably did not comfort the golfers who came face to face with the reptile. 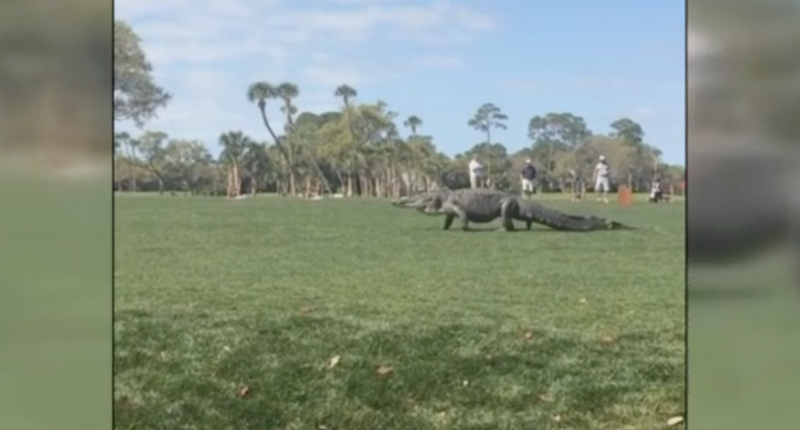 We’ve got to say, none of these golfers dealt with the gator as well as PGA Tour pro Cody Gribble, who earlier this month nonchalantly pushed an (admittedly much smaller) alligator back into the water during the Arnold Palmer Invitational. Now that is what you might call a hazard.